PanoStitcher™ automatically constructs 360° panorama images from a set of overlapping photos taken around a fixed viewing point. It then instantly converts the panorama images to wide wall posters, dynamic screen savers or interactive web virtual tour pages. The process is visual and guided; the features are concise yet complete; the operations are simple while robust. PanoStitcher is for anyone with a camera and a Windows-based PC--grandma and pro alike! Its rich feature set is to handle all possible real life situations. Main UI: shown are PhotoBench and blended panorama. 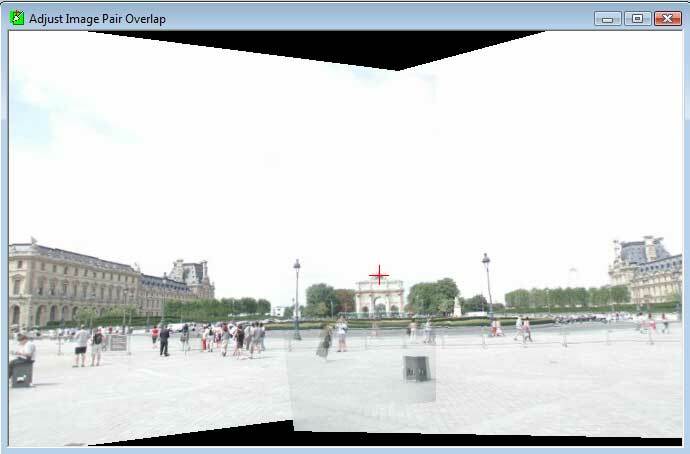 See PanoTutorial 1 for detailed steps, from stitching to virtual tour authoring. Leveler feature: to level panorama preview. See PanoTutorial 2 for its magic. Marker window of an image pair: to inspect and correct marker locations. Circles indicate alignment error. See PanoTutorial 3. Overlay window: a unique intuitive way to stitch image pair, especially useful for fluid features like ocean waves - see PanoTutorial 4. Free virtual tour authoring window: From stitching to virtual tour, PanoStitcher does it all. View the example Louvre tours.